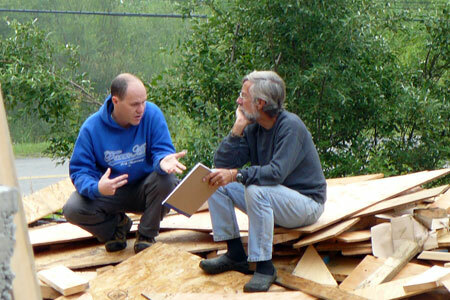 Late summer 2009, and Wally is trying to understand Bret Tofel's techspeak. 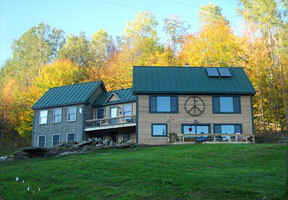 Bret, a neighbor, owns Reknew Energy Systems, the company that installed our small, domestic solar hot water system. Eventually, when we finally sell our old house and have some more money, we'll also install photovoltaics. Fall 2009 approaches and we know that we'll live in a sea of mud unless we turn some of the bare dirt to grass. 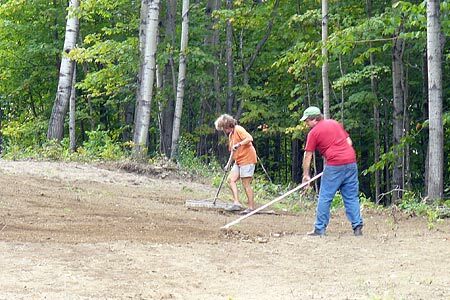 Here Barbara and Patrick, our youngest son, wield landscape rakes. 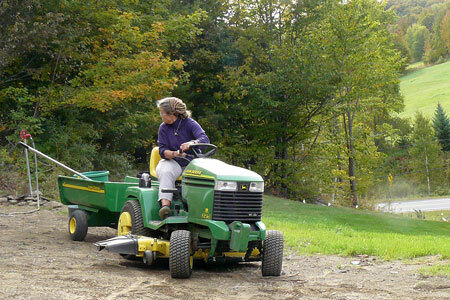 Below left, Barbara learns to love our tractor. 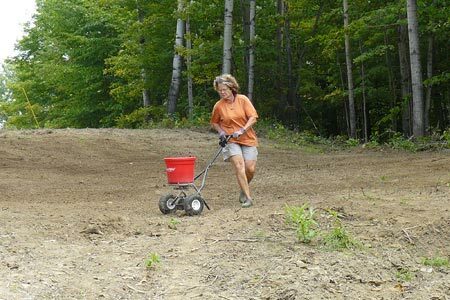 Below right, she's seeding what will eventually be part of a rough lawn. 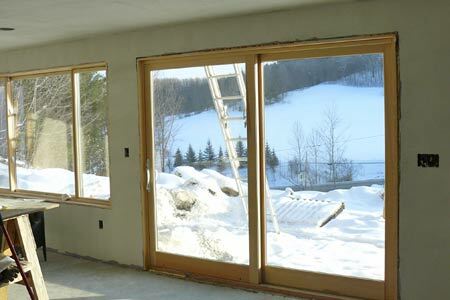 Winter 2009-2010 arrives, the exterior is nearly finished, and work moves indoors. 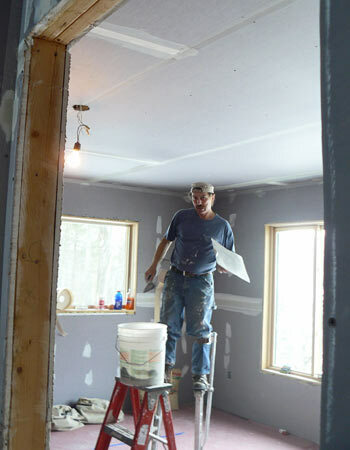 Below left, Jack Lamar helps Josh with sheetrock; below right, Storm Woodard (who does not like having his picture taken) does a fantastic job of plastering all of the interior rooms. He was helped by his son, also named Storm. Around the same time, genial electrician Mike Branch did all the wiring, but we never did get his photo. 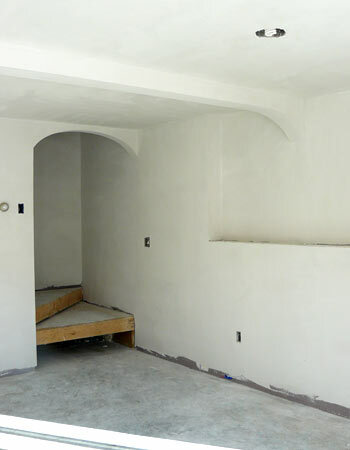 Left, the curved arches are one of Storm's trademark touches, and we like them because they'll go well with the Mexican tile that we plan to install here and there. 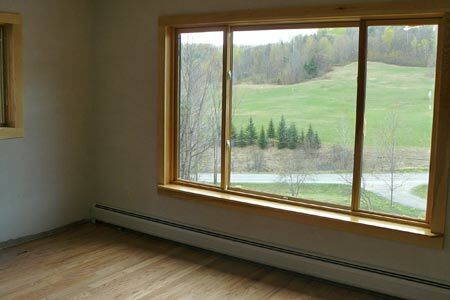 The living/dining area has an 8-foot window and an equally large sliding door. 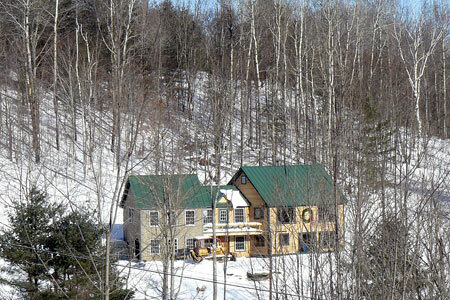 The house is very well insulated with spray-foam — tight, south-facing, and partially underground to the north. 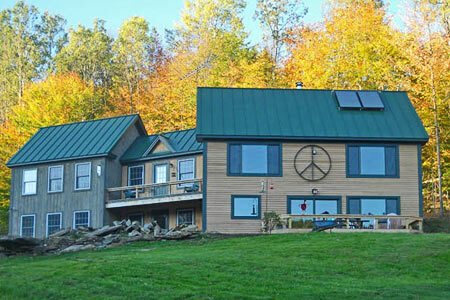 It's a classic "passive solar" design. There are only two bedrooms, both on the south side, and both with similarly large windows to the south. This is the master bedroom, nearly finished. 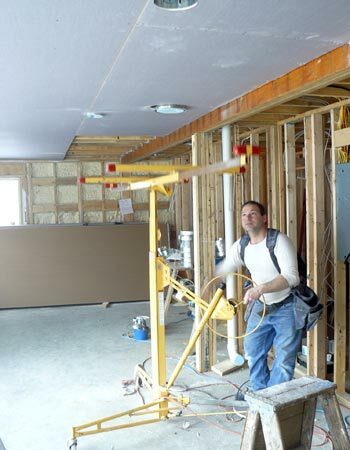 While the trim downstairs is cherry, we used pine upstairs, and the floors are manufactured wood rather than tile. 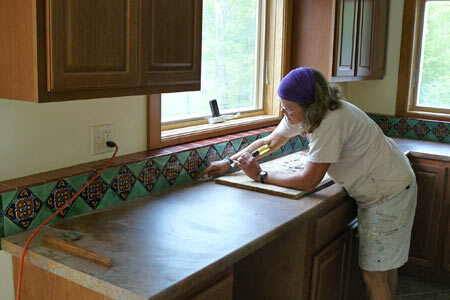 Barb grouts the Mexican tile we installed on the kitchen backsplash. Close-up of the tiled backsplash. 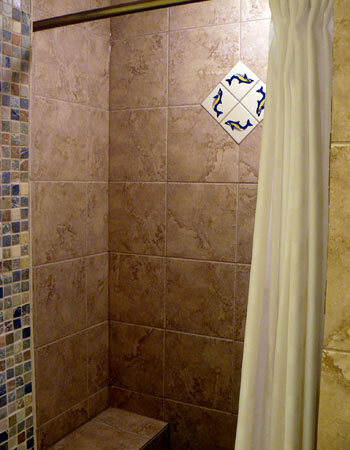 Barb is particularly fond of the little gecko tiles that appear here and elsewhere, unpredictably, in our tile work. 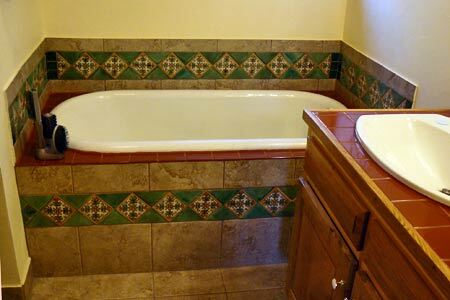 On tilework: Wally did all the decorative tile around the tub, below, but we called in a pro, Josh's friend Lars Lilienthal, to do the shower, since we don't want it to leak. 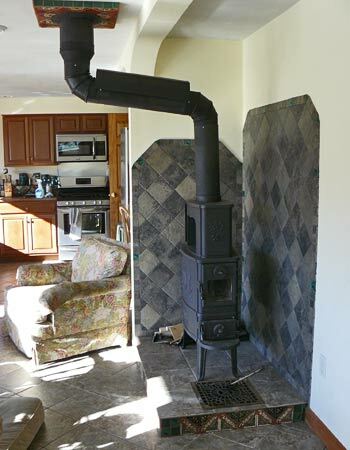 The wood stove is on the right. 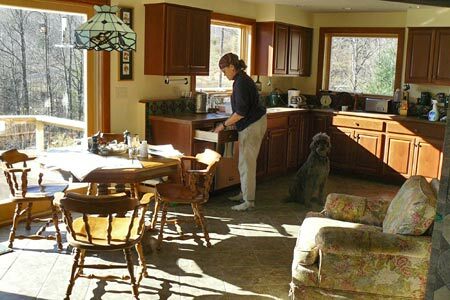 It's roughly centered between the kitchen and dining-living areas. The convoluted pipe is unfortunate, but necessary to keep the chimney out of the upstairs hall! Wally did all the tiling around the hearth. 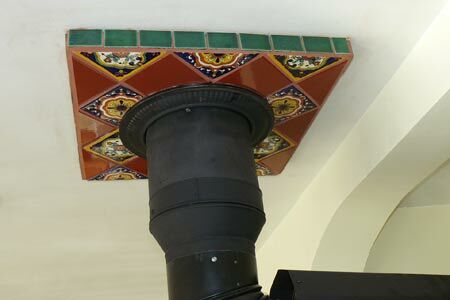 Below, detail of tilework where smokepipe passes through the ceiling. 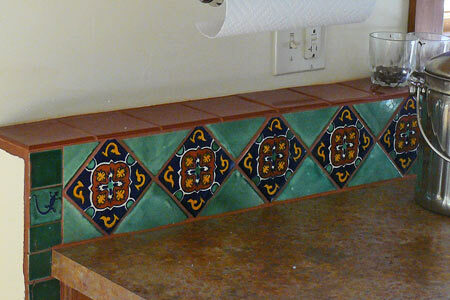 Barb did this tilework in the laundry room, just above the utility sink that she found at COVER — a great find! 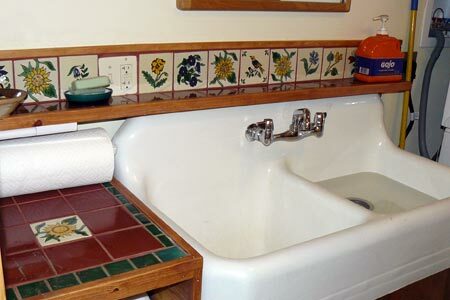 Just off the laundry is a tiny utility room. 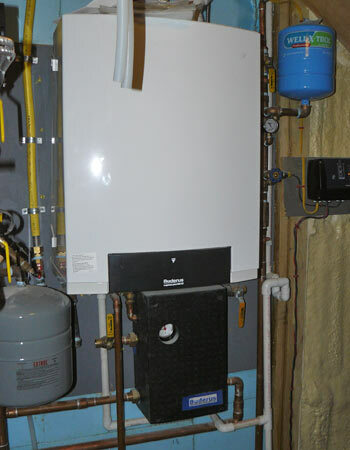 This is the small gas boiler that can heat the entire living area, upstairs and down, as well as provide back-up for the solar domestic hot water. All the plumbing was done by Audsley Plumbing Heating -- except for the solar system, installed by Steve Teel of Reknew Energy Systems. It is telling that nearly everything we bought in the way of high-efficiency, green technology — this boiler, our solar collectors, storage tank and controls, the deep-well pump, even some of the kitchen applicances — came from Germany rather than this country. 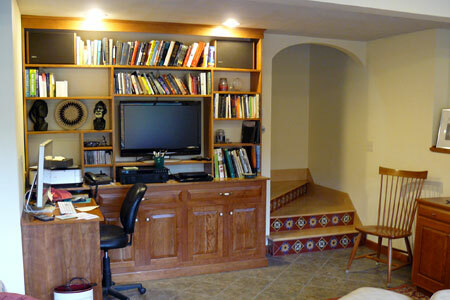 Left, cherry bookshelves and a window seat/storage box built in by Josh and Randy Lorette, a skilled woodworker and buddy of Josh. 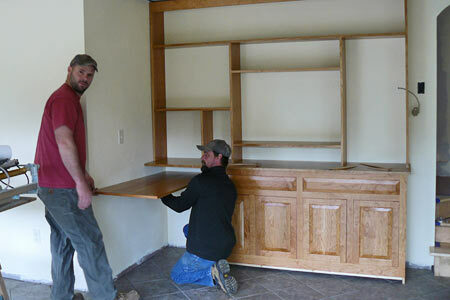 Below left, Randy and Josh working on built-in shelves and cupboards. Below right, the finished product. Wally installed the Mexican tiles on the staircase risers. All the downstairs floors were tiled by Josh. 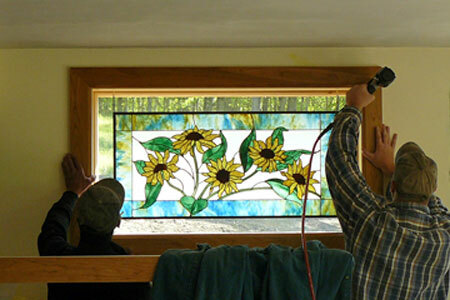 Josh and Randy finish installing a stained glass window on the east end of the living area. 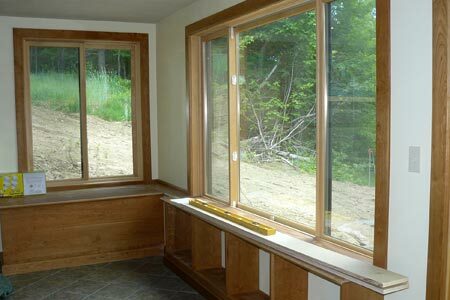 The window was made for us by Renaissance Glassworks in Nashua, New Hampshire. Josh finished a deck outside the living area, just in time for fall 2010. 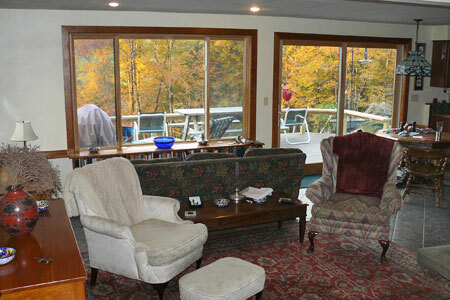 The nearly-finished living area, with the deck visible through the windows and door. This is taken from the foot of the stairs. 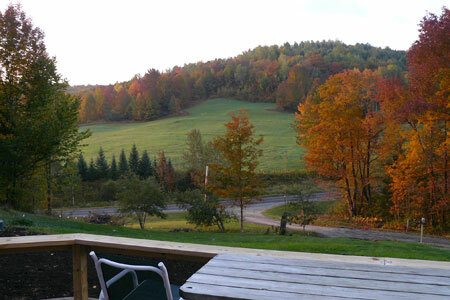 The wood stove is to the right, out of sight, and the dining area is in the backgroud right. Neither the house nor this website are quite finished, but close. Below left, the exterior is done, and the deck as well. The solar panels for domestic hot water are installed and working. The stonework to the left is a work in progress, but the lawn is really growing! 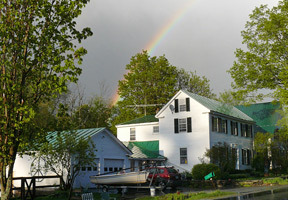 Efficiency Vermont recently came out and did an inspection; apparently we'll get a"5-star plus" rating, the highest. 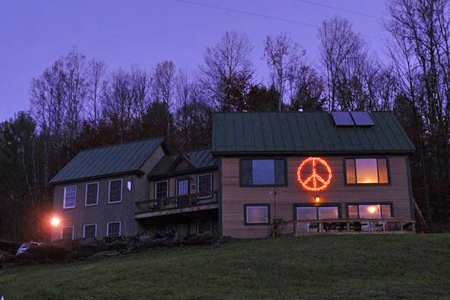 Below right, the house in the evening, with our neo-hippy peace light glowing. It shines through the trees onto Route 132 and it's becoming something of a landmark. We like it.